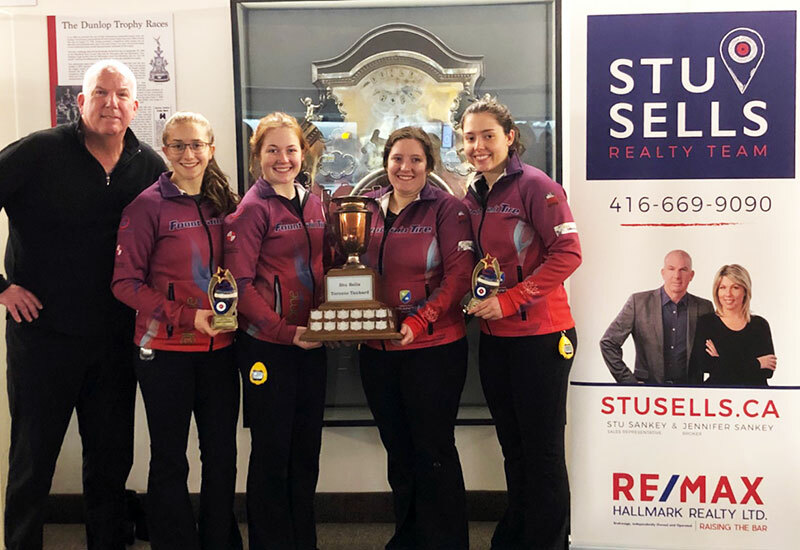 Kira Brunton (Sudbury, Ontario) wins the StuSells Toronto Tankard, defeating Cathy Auld (Toronto, ON) 7-4 at the Royal Canadian Curling Club in Toronto, Canada. Brunton with Megan Smith at third, Sara Guy and Kate Sherry on the front end take home the $5,000CDN first place cheque along with 38.560 world ranking points, while Auld receives $3,500CDN and 28.277 world ranking points for their second place finish. Starting with hammer, Auld scored 1 in the first end, when Brunton responded in the second end scoring 2. After a blank end, Auld scored a single the fourth end to tie the game at 2, then added a steal in the fifth end. Brunton scored a single in the sixth end, then forced Auld to a single in the seventh end. Trailing one with hammer, Brunton scored 4 in the eighth end for the 7-4 win. In the semifinals, Brunton defeated Jacqueline Harrison (Toronto, Ontario) 8-1 and Auld defeated Julie Tippin (Woodstock, Ontario) 6-5. Tippin and Harrison earned $2,250CDN and 21.851 ranking points for their semifinal finishes. In the quarterfinals, Brunton defeated Kristen Streifel (Regina, Saskatchewan) 6-5, Auld defeated Kerry Galusha (Yellowknife, Northwest Territories) 6-4, while Tippin defeated Stephanie Senneker (Kalamazoo, USA) 9-5 and Harrison defeated Jestyn Murphy (Mississauga, Ontario) 6-4. Galusha, Murphy, Senneker and Streifel earned $1,750CDN along with 15.424 ranking points for their quarterfinal finishes. Brunton went 3-1 in the 20 team round robin pools qualifying round. In their opening game, Brunton defeated Hollie Duncan (Toronto, Ontario) 5-4, losing their next game to Tippin 12-4. Brunton responded with a 8-3 win over Erica Hopson (Ottawa, ON) and then won 7-4 over Ashley Howard (Regina, Saskatchewan) in their final qualifying round match.